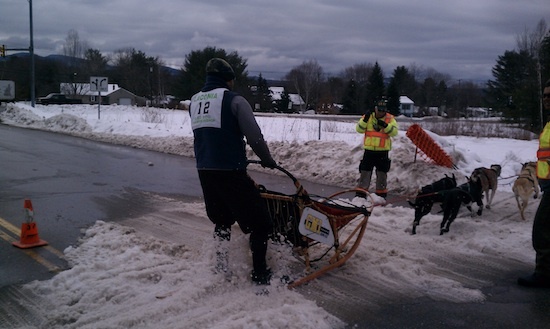 On Friday, March 1, 2013 and Saturday, March 2, 2013 I had the pleasure of providing safety communications for the 84th Laconia Sled Dog Championship Races. It’s a sprint-type race for the dogs and mushers, and I can tell you that you need to be paying attention as a ham radio operator. Each day I tried to get to the starting line to help David Megin, KA1VJU, to set up the tent and 2-meter antenna. By 8:30 a.m. all the ham radio operators were either at their assignments or on the way. Dave stayed at the start / finish line to run net control. Net control is the communications hub for an event like this. All radio communications are directed to net control from each of the assignment areas. It’s the job of net control to collect all information as to the location of the sled dog competitors. This information is then provided to the race officials if they need it. The ham radio operators in the field know to only be transmitting if they have needed information from their location. This is important so the frequency remains open in case of an emergency at one of the assignments or net control needs to communicate with one of the ham radio operators at a specific location. There were three races each day. The morning started with a six-dog race that was very exciting. The afternoon race was fascinating because it’s an unlimited competition. A musher can put as many dogs as she/he desires in front of the sled. The most dogs I saw pulling a sled was fourteen. That was a sight indeed. There’s about an hour break between races, and since the course is not that big, many of the ham radio operators come back to the net control area to hang out, eat or just network with each other. My favorite race of the event was on Saturday. It was a three-dog race on a short course. The mushers were mostly kids aged 8 – 14 from what I could see as they glided by my remote spotter location in the woods. I can tell you that working a public service event like this is extremely rewarding. You get a sense of accomplishment and you get to be up close to some very cool dogs – and humans too!